Paddle FIT sessions run for 1.5 hours. Each session incorporates a mixture of paddling and a few location stops along the way for some strength and conditioning exercises. 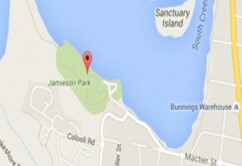 Where: Jamieson Park Paddle, The Esplanade, Jamieson Park, Narrabeen Lake. See map below for details.